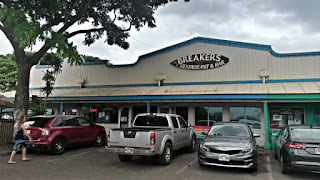 Breakers Restaurant and Bar is located on Kamehameha Hwy in Haleiwa, Hawaii. 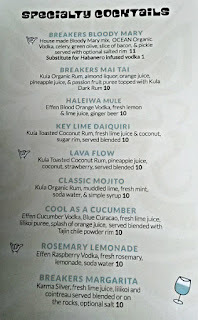 In Old Town Haleiwa, there's a lot to see. Not far from the beach, lots of shops, and a bunch of places to eat. 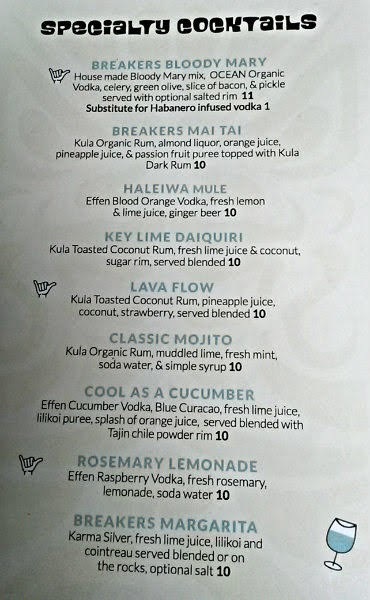 However, there are only a couple of places there where you'll really have a good selection of alcoholic beverage choices. 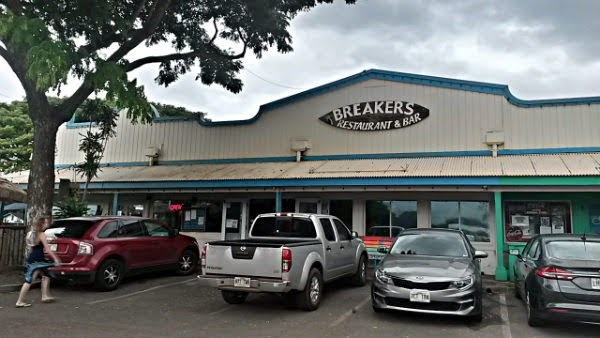 Breakers, with beer, wine, and cocktails, is arguably one of the better options in the area. Several beers on tap, and more in bottles/cans. 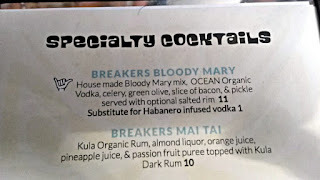 They even have a Bloody Mary with habanero infused vodka as an option. 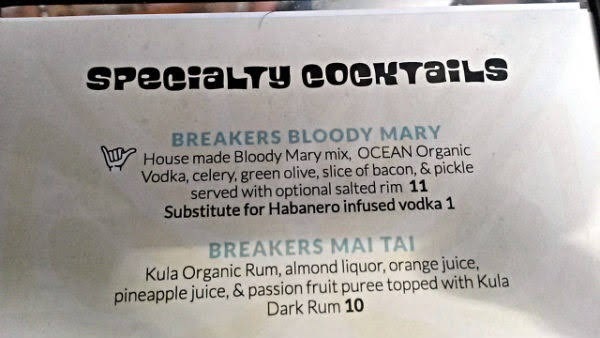 I don't care for Bloody Marys, though. 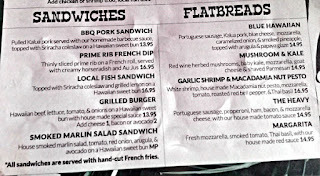 But check out that lunch menu. 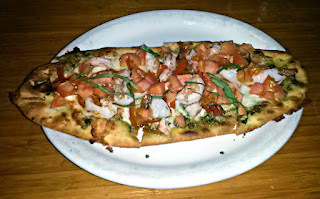 Appetizers, plates, salads, soups, and flatbreads. I just about wanted everything on there. Since I was in Hawaii, I started with the Breakers Mai Tai ($10): Kula organic rum, almond liqueur, orange juice, pineapple juice, and passion fruit puree, topped with Kula dark rum. 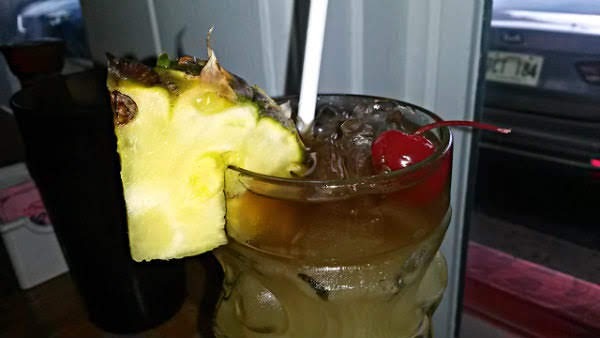 Garnished with a pineapple wedge and a maraschino cherry. Believe it or not, that was among my first Mai Tais ever, if not the absolute first. I might need to get more of those in the future. Very well done here. 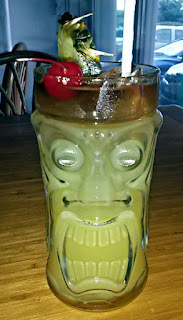 All the tropical shines through and while the rum is there, it doesn't overpower the drink. 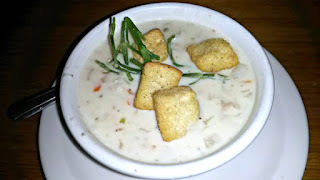 I next tried a cup of Coconut Clam Chowder ($6.95), their house-made clam chowder with lemongrass coconut cream, paprika oil drizzle, croutons, and micro greens. I didn't get too much of the lemongrass, coconut, and paprika here; it basically passed for a good clam chowder. Everything was delicious, but nothing that really set it significantly apart from other outstanding clam chowders that I've had. 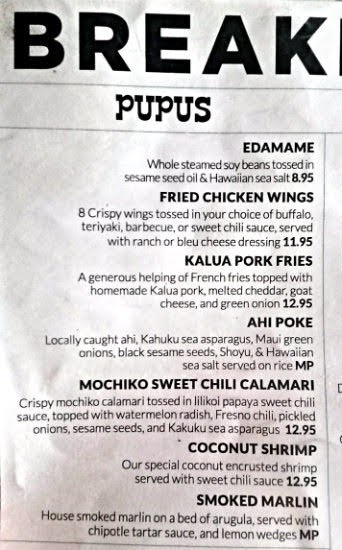 The Mochiko Sweet Chili Calamari ($12.95) was next. 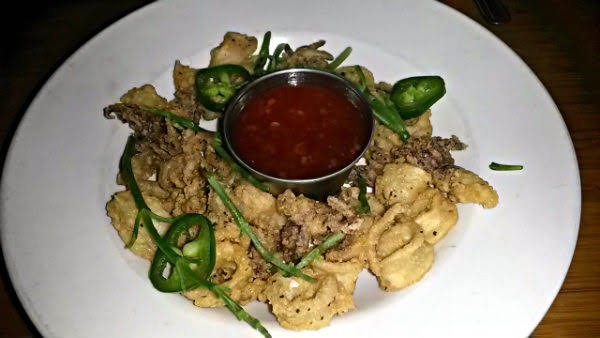 Calamari was tender, not overcooked, and only lightly breaded. Green Fresno chile slices were de-seeded. 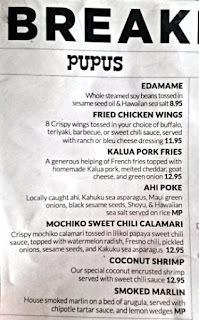 The description mentions a lilikoi papaya sweet chili sauce, but it mostly tasted like a regular sweet chili sauce to me. And it may be a tiny portion, but still wonderfully executed. Just give me a tray of that calamari and I'll be happy. 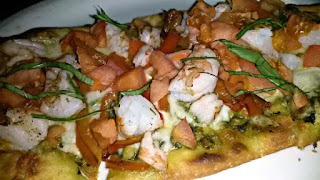 The Garlic Shrimp and Mac Nut Pesto flatbread ($16.95) was by far the best food item that I had at Breakers. 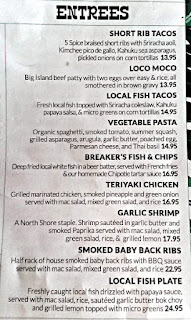 Juicy, tender garlic shrimp, and that macadamia nut pesto was incredible. Very crispy flatbread that holds everything well. The flatbread is maybe eight inches long and cut into five slices. It would be an acceptable size for one person. 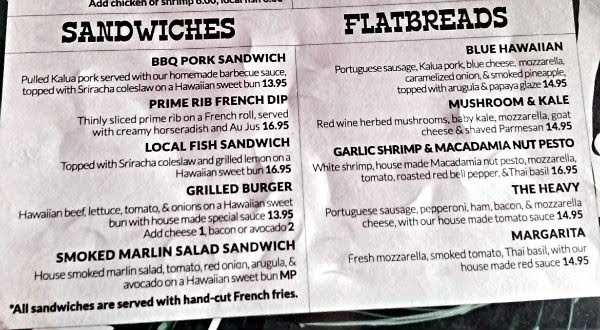 For two people, a nice appetizer to share. You can easily spend a bunch of money here, so your wallet may cry a little. 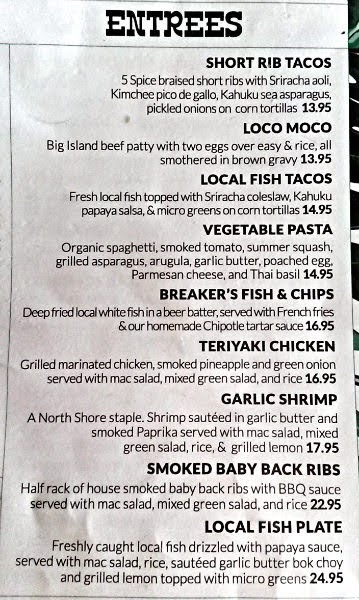 Still, Breakers is an ideal place to watch your favorite sports game.